The sample agents are a collection of different types of website scraping agents to help you learn quickly and build the best scraping experience online. Starting April, 2017, you can access the sample agents by clicking on the New Agent button on top right corner after logged in and then click on the corresponding agent Get it button to copy the sample agent in your account to try out. Once you've the agent in your account - You can see how it works, what selectors are used to see in agent editor option and obviously free to edit, add fields or change the configuration you want to enhance your scraping skills. The "Sample Agents" is available in each hosted scraping app account in cloud. 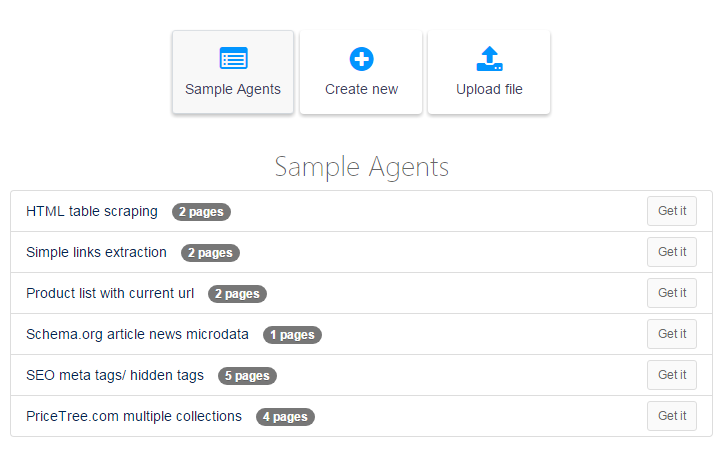 Right now, we've uploaded 6 different structure agents to demonstrate scraping of html elements like links, images, hidden tags, meta tags etc. and will continue uploading more demo agents in coming months.